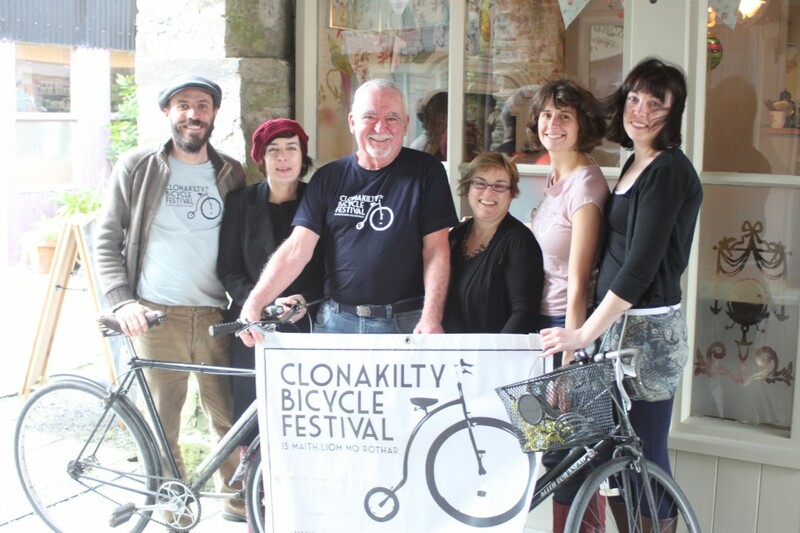 Clonakilty Bicycle Festival is a non-profit organization run by a group of bicycle loving volunteers. Justin Grounds (far left, beard, hat): one of the founders of the Clon Bike Fest, Justin can be seen regularly cruising the streets of Clonakilty on one of his many vintage bicycle rebuilds. Handy with a spanner, and dreaming up big ideas, he also does some of the design, video and screenprinting. Cathy Sharma (red hat) is our newest addition to the team, a world-traveller and lover of community projects, who knows just about everybody in Clon, and is great at connecting people. Jack Kelleher (centre) was at just about every event last year and now is a major part of our crew, a self-confessed ‘dirty old bike mechanic’ and ‘philovelo on the road to shambala’; if Jack can’t fix it then no-one can! Jack runs the bike clinics and loves to encourage people of all ages to get in the saddle! Majella Deasy (right of Jack with glasses) got back on her bike after 15 years to take part in last years’ ‘Meals on Wheels’ event and has never looked back (except to check for traffic!) She’s a powerhouse of positive energy and general good vibes! Allison Roberts (pink t-shirt) is another founder member, community organizer and avid permaculturist. Mostly seen riding her bike with a basket full of plants, veggies and chocolate, she lends her eye to design, organizes the nitty-gritty important things, and generally oversees it all! Angela Larkin (far right) is the third founder member, a veritable gazelle on a bike and the part of our team who rides the triathalons and puts us all to shame with being so incredibly fit! She is very involved with connecting with our local schools and organizations. Get in touch with any of us or come and say hi and have a chat!